Considering the Divine Constabulary gets to investigate all the cool supernatural crimes, while Department Six is stuck with the boring human cases, inter-agency rivalry is probably inevitable. However, it becomes quite pitched when the leader of the former is accused of murdering the commander of the latter. Everyone should probably know better, but they have to admit the evidence looks pretty bad. 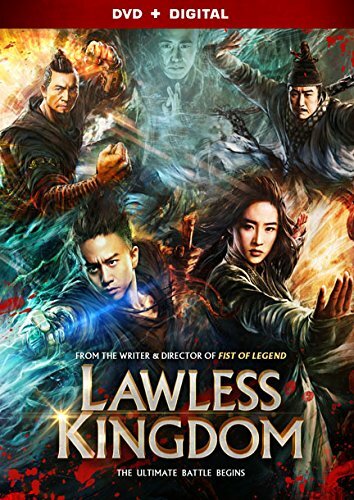 Some kind of scheme is afoot involving crimes from the past in Gordon Chan & Janet Chun’s Lawless Kingdom (trailer here), their sequel to The Four, which releases today on DVD from Lionsgate. Based on the 1970s wuxia novels, The Four are like Song Dynasty Avengers, whose powers are derived from chi. When it comes to that chi, their leader Zhuge Zhengwo and the wheelchair-bound Emotionless have levels that give them Professor X-worthy mental and telekinetic powers. Iron Hands is the muscle, Life Snatcher is their Flash, and it is just a bad idea to anger the lycanthropic Cold Blood. Yet, for some reason Zhuge does exactly that when he appears to fire a steampunkish firearm at the werewolf. When Cold Blood recovers, he demands answers from his boss, who promises them in two days. Unfortunately, he is arrested for the murder of Department Six’s Sheriff King before the allotted deadline is up. To make matters even more awkward, another soon-to-be dead man claims to be one of the Gang of Twelve, who murdered Emotionless’s family and irreparably damaged her legs. Supposedly, Zhuge dispatched them all to their eternal judgment at the time, so what gives? Watching Lawless Kingdom (a.k.a. The Four II), it seems strange that the disability community has not vocally embraced this series. Emotionless might have been the victim of a crime, but she is no passive object of sympathy. In fact, it is arguably empowering and certainly cool to watch her laying down martial arts beatdowns with the aid of Iron Hands’ prosthetics. She is particularly assertive in Kingdom, contributing some series highlights and compensating for its conspicuous status as a middle bridge film, between the relatively self-contained first installment and the conclusion that has already opened in China. Regardless, if you like The Four (and we did), Kingdom gives you more, while exploring the characters in greater depth. Anthony Wong and Crystal Liu Lifei have some particular fine moments as Zhuge and Emotionless, whose surrogate father-daughter relationship will be strained by deceit as well as the truth. Although Sheng Taishen’s Sheriff King is presumably dead for good, he is wonderfully sly and slippery in his limited screen time. Deng Chao and Collin Chou also solidly perform Iron Hands and Cold Blood’s action roles, but Ronald Cheng’s Life Snatcher is inexplicably stuck on the sidelines for much of the film. While the major villains stay behind the Wizard’s curtain, former newscaster Liu Yan makes a memorable femme fatale as Ru Yan, a rather insidious colleague of Ji Yaohua, Emotionless’s rival at Department Six. Considering how much spectacle Chan and Chun put up on screen, it is rather impressive how directly they keep it all connected to the human element. They create some terrifically fantastical set pieces, including a Mordoresque prison specifically designed for those blessed with superhuman chi. For wuxia and superhero fans, it is all good stuff. Recommended especially for those intrigued by the Emotionless character, Lawless Kingdom releases today (9/1) on DVD from Lionsgate.